We have spent countless hours refining our testing protocols and data processing methodologies. We’ve worked with R&D experts from some of the largest companies in golf with the singular goal of creating the most informative test for the golfing consumer. The number of testers we use, the number of shots we collect, they way we analyze data, even the way we sort and randomize clubs during the test itself was directly influenced by the conversations we had with those experts. The result is what we believe to be the largest, independent, 100% Datacratic wedge test you’ll find anywhere. For 2017, 20 golfers across a wide-range of ages, swing speeds, handicap and abilities participated. Our group of testers includes collegiate golfers, retirees, and average golfers just like you. Here are a few more details about our participants. MyGolfSpy’s 2017 Most Wanted Wedge Test was conducted over the span of one month. In total, the 20 golfers who participated in our tests spent more than 80 hours hitting over 10,605 total shots. To collect a valid sample size across all testers and all clubs, each tester participated in 4 sessions. To minimize the impact that day to day swing variances may have on the final results, club group order was randomized, as was the order in which clubs within each group were hit. Testers were asked to take 3-4 swings with each club before moving to the next club in the rotation. The process was repeated until we achieved a sample size of 10-12 ‘good’ shots for each tester with each club. 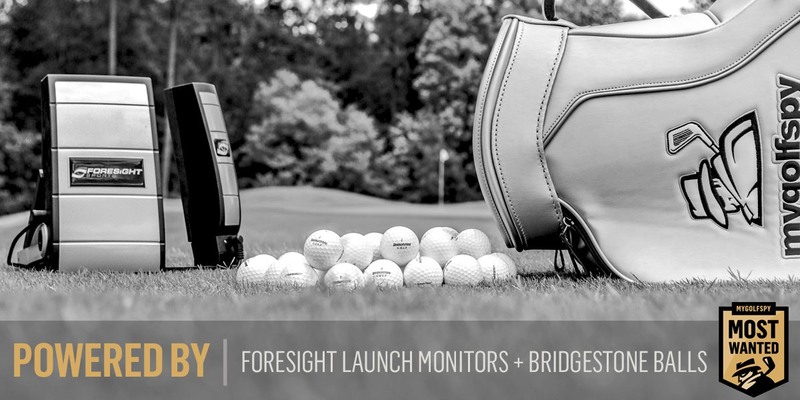 Ball flight and clubhead data were collected with a with a Foresight GCQuad Launch Monitor. All head data was captured using Foresight HMT. All testers hit Bridgestone B330-RX golf balls exclusively. Balls were inspected after each session. Any ball showing signs of wear was replaced. Data was exported and checked for errors. Outliers were then identified using a statistical approach developed at MyGolfSpy. Shots identified as outliers were dropped before the data aggregation and final averages were calculated. MyGolfSpy tested sand wedges with lofts of 56° in regular and stiff flex. Where some wedges offered two stock shaft options, preliminary fitting was done to choose the optimal shaft for each tester. Unlike most other large equipment tests, our awards and rankings aren’t determined inside a conference room. We don’t have a panel, and there are no votes. The launch monitor is the one and only judge. We collect a standard set of launch monitor metrics (ball speed, launch angle, spin rates, distance, etc.). Overall winners are determined using a methodology we have developed called TRUERank. What we have developed is the most accurate test to determine the leaders in the wedge category. We do realize that data is inherently interpretive, which is why we choose to share our data with you. For those who prefer things clean and simple, we have provided our data-driven rankings. For those of you who want to dig deeper, make your own interpretations, and draw your own conclusions, we share our data with you. Note: This page is updated on an annual basis to reflect the latest information about how we test. As such, it may not be wholly applicable to previous tests.